Mystery Lovers Kitchen is delighted to welcome bestselling author Laura Bradford to our kitchen! We think you will love both her white chocolate peppermint blondie recipe and her new Amish mystery, SUSPENDERED SENTENCE. To be entered in today's drawing, make sure you leave a comment, including your email. Welcome Laura! LAURA BRADFORD: Over the last decade or so, I’ve developed quite a love affair with white chocolate. But it took my daughter pairing it with peppermint in a to-die-for hot chocolate over the holidays to send me into the kitchen with a mission of my own: to create a white chocolate peppermint blondie. Preheat oven to 345 degrees. Grease a 9 x 9 pan. 1. Melt the 8 ounces of chocolate with the butter in a double boiler. Stir constantly until smooth. Allow to cool. 2. In a large bowl, beat eggs well. Add vanilla, peppermint, and sugar. Mix. 3. Add melted white chocolate to mixture. Mix. 4. Combine the flour and salt and then add to the white chocolate mixture. 6. Spread the batter into the prepared pan. 8. Sprinkle the remaining white chocolate chips and crushed candy cane across the top of the blondie and let cool on a wire rack. Now Detective Jakob Fisher—once a member of the Amish community himself—is determined to solve the young woman's murder. With Claire's help, he must dig into the past and bring to light long-buried secrets—secrets that someone is willing to kill to protect. Laura Bradford is the best-selling author of the Amish Mysteries and the Southern Sewing Circle Mysteries (written as Elizabeth Lynn Casey) with Penguin Random House. A third cozy mystery series will be added to the mix in 2016. Laura is a former Agatha Award nominee, and the recipient of an RT Reviewer’s Choice Award in romance. 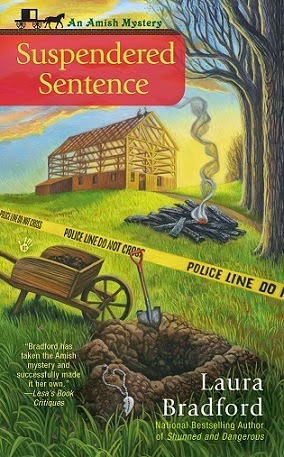 SUSPENDERED SENTENCE (the 4th Amish Mystery) is now available. WEDDING DURESS (the 10th Southern Sewing Circle Mystery) will release April 7th. In her free time, Laura enjoys making memories with her family, baking, playing games, and catching up with friends. To be entered in our drawing for a copy of Suspendered Sentence, Laura’s new Amish Mystery, and this “Amish Mysteries” tote bag, leave a comment including your email. I love this series and can't wait to "go to Heavenly Pa" again. This recipe sounds great, so does the book. I love this series. Thank you for the chance. I am so looking forward to reading this book. My library doesn't have it yet. Would love to have a copy of my very own! Love this series. I'd be thrilled to get the book now. Thanks for hosting me here, today. And thank you, to all of you, for stopping by! I love reading Amish mysteries. Would love to win and read this book. Thank you for the chance. Another recipe that I'll have to try since I like chocolate, but not overwhelming chocolate---and the mind sounds delightful. Thanks for the contest. I'm not crazy about white chocolate but I love peppermint. Thank you for sharing your recipe~looks so yummy! Your book sounds like a terrific read~I love the title and the cover! That tote is awesome! Thank you for a great review and contest! Hi Laura! So nice to see you here. Your title makes me smile every time I see it and the story sounds very interesting! Love those decadent brownies, too!!! Thanks, Krista!! I loved being here! I love reading Amish mysteries. Ive read earlier ones in series. Would love to win and read this book. Thank you for the chance. I enjoy the Southern Sewing circle mysteries, too! I like the white chocolate but I'd forego the mint part. Your book sounds wonderful. I'd love to read it.